architects have time to think. architects are educated to solve problems and propose innovative solutions. now what? is an initiative designed to tap into the wealth of creative talent amongst graduates and students who need space to research, learn new skills and people to discuss these with. a series of multi-disciplinary public conversations; workshops; studio space and facilities available for research; publication of all work plus a public exhibtion at the end of the summer. The entire initiative is to operate as a think-tank, is free of charge and will be run on a voluntary basis. The Art & Design Degree Show at Manchester Metropolitan University will run from Saturday 20 June to Sunday 28 June. The graduating Bachelor of Architecture students of the College of Continuity in Architecture will be showing their work in Rooms 502 and 503 of the Chatham Building. The Private View will take place at 6 pm on Friday 19 June, when the new MSA catalogue will be available. Here is a film of the work of some of this year’s projects based in Vicenza. Small black and white prints found in the plan chest. 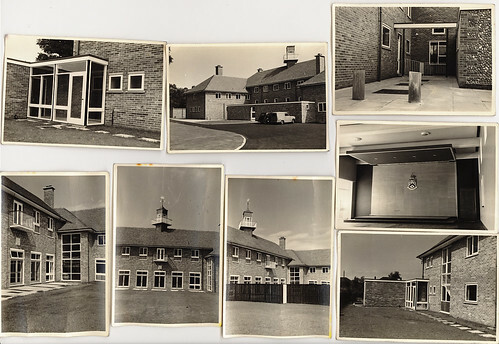 I believe these show new buildings for Gresham’s School in Holt, Norfolk designed by Grenfell Baines & Hargreaves of Preston (later renamed Building Design Partnership) and photographed soon after completion (1959-1960?). Simple roof forms, minimal porches, panels of rustic materials and a festive lantern with weathercock. George Grenfell Baines, founder of BDP. More from the bottom drawer. AO: What were the principles underlying the Quinta da Malagueira project and what is the importance of vernacular architecture in this project? AO: I find the Malagueira is a representative project almost of the Alentejo culture, I do not know if you agree with that? AS: There are many reasons for each thing in architecture. I have also heard this sort of project being classified as neorationalist, for example, and of course nobody is working today without having the background, even if they deny it, of the evolution of architecture which is usually called rationalism. I do not think we can separate the reasons of architecture by this or that, I mean, there are many reasons combining, sometimes there is even the taste of the promoter, which is something that isn’t often mentioned, but which obviously has influence. AO: I chose Malagueira for two reasons because on the one hand it has a very strong relationship with the place, with Évora, with the environment, with the ethos, and on the other hand it has almost a vision of the future, for example, because that one element that binds the whole, … I think these two aspects of relationship with the place, and demand for a relationship with the future are, in my view, essential. AS: Yes, once again I agree, but there are several, but you mean the viaduct. One of the reasons for the viaduct, is really a relationship, it is no coincidence that under the viaduct there is a great pedestrian way and beside it there are cars, I do not like this thing pedestrians to one side, and cars to the other. By the way, in Évora when I got the job, the idea was to make some collective garages, and those narrow paths, between houses, were pedestrian, also because lots of cars was unthinkable in Malagueira, because that was really meant for poor people, and a quick change was not expected, which was a mistake to predict. But what is a fact is that it started, more cars began to appear, more cars, …and people created a very interesting rule, that in front of every house, there is an eight-meter stop for the owner and nobody else, and going along well with this rule, no one violating this rule, then the streets are too narrow for the cars, but there too, as there are no sidewalks, there are no accidents because the car driver cannot accelerate like a Formula 1, he has to drive slowly because otherwise he will scratch the car, hurt people … Oh the viaduct, the viaduct, well, about my saying that there is a parallel between cars and pedestrians, one of the reasons for the viaduct is that I knew from the start that there would be no money for infrastructure. AO: The very simplicity of the materials of the viaduct? AS: Out of the same rule not to bury drains, … a network gallery could be made and kill two birds with one stone, introducing a new scale waiting for the equipment, because as you know, there are distributed gaps in the plan, which are designed for equipment, a number of request of the town hall … Put simply no money ever came. What I could not imagine is that until now no money would come, and money still does not come. AS: It is not always external, because sometimes it comes from professionals, obstruction by professionals themselves. AO: The existential place has an important role in the outcome of your projects and works. Do you consider existentialism as thought important in the shape of architecture itself? AS: Yes existentialism is something that is almost no longer spoken of, but it is not something that is gone, a thought that is not included in the way of thinking today, but I do not know what sense architecture is seeing, but what I find important in architecture, is the attention to how people live and how they want to live. The balance is always variable, ambiguous but it has always some lines of force, which we must try to understand, that is, one of the problems of architecture is the understanding of what is happening and what is happening is always persistence and innovation. AO: Because the relationship with the site is part of sustainability? AO: How do you see the future of architectural creation and its relationship with society. AS: Well I see a black future, if the trend is to give major strength to every expertise, forgetting that journey I was talking about. If I am right, I may not be… (there is) the gap between the one who projects and the one who will be using the projected product. In all fields of architecture there are also new generations that are normally assimilating the huge increase of information that is coming, and (developing the) means to assimilate this information and I want to believe (in) that.